KoopaTV: Capcom SUMMER Sale 2017? Buy Ace Attorney at Big Percents Off! Capcom SUMMER Sale 2017? Buy Ace Attorney at Big Percents Off! By LUDWIG VON KOOPA - 'cause a winter sale ain't enough. We dutifully and breathlessly advertise all of the sales that CAPCOM has to offer. I didn't think there would be another one for another several months, but, hey, CAPCOM just invented the CAPCOM Summer Sale and is acting like it existed this whole time. I believe the last CAPCOM sale was back in February. Those were great deals there. So, what are the percent discounts greeting the Ace Attorney games this time? 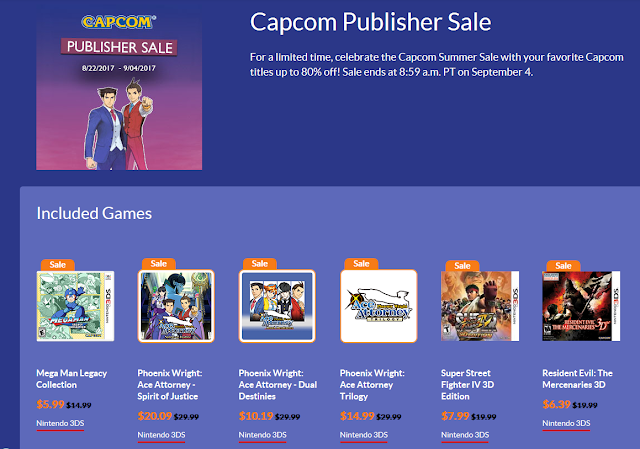 Nintendo erroneously calls it the “Capcom Publisher Sale”, but CAPCOM never even used the word “publisher” to describe it. Phoenix Wright: Ace Attorney — Spirit of Justice is 33% off. Phoenix Wright: Ace Attorney — Dual Destinies is 66% off. Phoenix Wright: Ace Attorney Trilogy is 50% off. The previous deal from February had Trilogy at the same 50% off (as did the deal before that), while Spirit of Justice actually got its discount weakened from 40% to 33%. However, Phoenix Wright: Ace Attorney — Dual Destinies got its greatest discount of all time: From a previous high of 60% off, now to a high of 66% off! It's the perfect time (how many times do I keep saying that?) to buy all of the Ace Attorney games on your Nintendo 3DS, for soon, this November, Apollo Justice: Ace Attorney will also be available on the Nintendo eShop. Then you can have every mainline Ace Attorney game on ONE system, and you will have obtained most of them at ridiculously low prices! Quite frankly, they're all worth your purchase at prices even higher than their base price, so... Get to buying. The sale ends September 4, which is enough time for you to get an extra $10 Nintendo eShop credit to your account by winning Round 15 of the KoopaTV Loyalty Rewards Program! (...Which ends in less than two hours.) You can get a quick come-from-behind win by looking at those big-ticket items under the How to Win? section. Ludwig likes winning, and he likes helping you win. There is no better win than treating yourself to Ace Attorney games at exceptional prices. If you have any questions about why you should buy the Ace Attorney series, or what the series is about, ask away in the comments section! Also, one more reason to buy NOW: Miiverse functionality, which is absolutely a big plus for the Ace Attorney games, will be destroyed come the beginning of November. That doesn't leave much time left to document your Ace Attorney experiences! If you wish to read a spoiler-free review of Phoenix Wright: Ace Attorney — Dual Destinies, click here! You thought these percents were big? There's even BIGGER percent discounts for November! The Capcom Publisher Sale returns for 2018, but it's not in the summer and it's actually called the Capcom Publisher Sale. The CAPCOM Summer Sale 2018 is its own thing, with much steeper discounts! It is still hard for me to want to buy again the Trilogy and Apollo Justice since I have them all in cart form and it is getting harder for me to play much games because of baby. Baby seems to know to cry when I finally play a match in Splatoon. As I said on Miiverse, there's no point in getting the games for a second time on 3DS without Miiverse functionality. That said, the Ace Attorney series seems to me to be a series that is more maternity-friendly than Splatoon, since nothing is in real-time.